Last night my husband and I were supposed to be listening to Canada’s former Prime Minister, Jean Chrétien, talk about his new book, My Stories, My Times. The evening was hosted by Kingston Writersfest and John had bought advance tickets. When we arrived at the venue, there was no record of our purchase. On checking the printout, John had bought tickets for Ottawa’s Writersfest on November 1st! Thank goodness the ticket sellers took pity on us and only charged us the advance price; since their credit card reader was not functioning, we barely scraped together the cash to pay for our tickets. As the 7:30 start time approached, a woman took the microphone. Due to the first snow of the season, Mr. Chrétien’s plane had been diverted from Kingston to the Trenton Airforce Base, 75 minutes west. She apologized for the delay. Shortly thereafter, a representative from Random House Canada announced that the publisher would pay for a drink for everyone to thank us for our patience. The line at the bar immediately grew and the volume of conversation heightened. At 8:15, the Artistic Director took to the podium. The crowd stilled in anticipation of the arrival of our guest. It was not to be. She assured us that Mr. Chrétien was on his way by taxi and would arrive soon. In the meantime, Senator Jim Munson had agreed to share some of his own stories with us. It was an entertaining interlude, appreciated by all. At 8:40, to hearty applause, Mr. Chrétien arrived. Unflappable, he joked about starting out from Trenton by taxi, but then the RCMP were called in. With lights flashing, he was escorted to the Kingston Holiday Inn for his presentation. In conversation with Senator Munson, the rest of the evening was a mix of humour and discussions about serious topics, such as current political conditions globally. 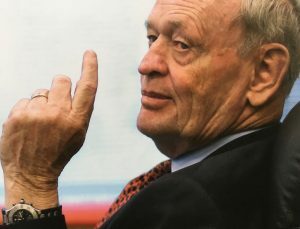 After questions from the audience, the evening wrapped up at 10:00 pm and Mr. Chrétien departed for Toronto and his next appearance. Quite a daunting schedule for an 84 year old! Despite the rocky start to the evening, it was a pleasure to listen to this consummate story-teller share personal anecdotes and behind-the-scenes details about his decade as Canada’s 20th Prime Minister. Well worth the wait.